In Birmingham, England 3D printing is helping reanimate a closely guarded collection of ancient Egyptian artifacts. At world-renowned Eton College, the Eton Meyers collection represents one of the world’s best private accumulations of ancient Egyptian art. Among the collection is one item of particular intrigue, a millennia old, mummified hand. 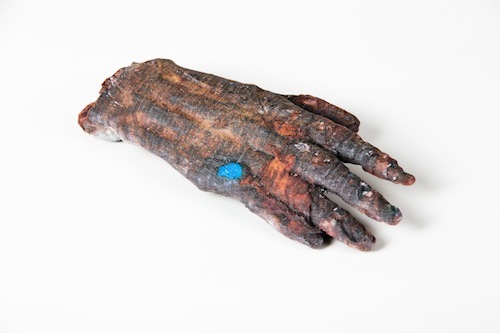 In and effort to give the mummified hand, and it’s constituent collection, greater exposure the University of Birmingham has 3D scanned and printed a full color replica of the severed appendage. Using a MCOR IRIS printer the 3D laser scan of the hand was built from numerous slices of full color paper rendering a model that can be handled without fear of damaging the mummy’s delicate flesh. As we’ve seen in the past museums are on the forefront of leveraging 3D printing technology. When combined with 3D scanners, 3D printers give museums the power to create immersive educational experiences, let alone their ability to resurrect the past!